Sulitest is an international movement led by an independent NonGovernmental Organization (NGO) whose mission is to support expanded sustainability knowledge, skills, and mind-set that motivate individuals to become deeply committed to building a sustainable future and to making informed and effective decisions. Sulitest develops a set of online tools (https://www.sulitest.org) to raise awareness and to improve understanding of the 17 Sustainable Development Goals (SDGs) of the 2030 Agenda. Sustainability and education have been increasingly intertwined from the creation of UNESCO in 1945 to the adoption of the 2030 Agenda’s 17 SDGs in September 2015. Education plays a major role in empowering individuals and future decision-makers so that they are able to face the complex and key challenges of the twenty-first century, including enabling change and collectively building a sustainable future. Higher education has an important role to play in this agenda by creating change agents. An abundant literature documents the role of higher education in promoting sustainability (Bullock and Wilder 2016; Yarime and Tanaka 2012) and in enhancing sustainability knowledge, skills, mind-sets, and/or behaviors (Cotgrave and Kokkarinen 2011; Missimer and Connell 2012; Swaim et al. 2014). Academic research extensively documents both the efforts made by universities to incorporate sustainability into their core activities and the challenges they are facing (Lozano et al. 2013; Leal Filho et al. 2015; Aleixo et al. 2018). However, few studies estimate the impact of these efforts on the sustainability knowledge of their students and graduates. This chapter highlights the contribution of the Sulitest initiative to fill this gap by collectively building online tools to raise awareness and to provide empirical data mapping sustainability literacy. It aims at emphasizing the role of the community to co-create and to improve Sulitest’s tools. It provides an overview of these tools and the diversity of their potential uses. Sulitest’s best-known tool – the Test – is an online, easy to use, multiple-choice-question format that uses an algorithm to select questions from an expert-approved database. The selection of the questions relies on a foundational matrix, ensuring that each session of the Test covers a comprehensive scope of sustainability and a systemic perspective between topics. Every question comes with a learning statement to provide information and to motivate the candidates to learn more. The database also associates each question with one or more goals of the Global Agenda, making sure to raise awareness of the 17 SDGs and helping to create a large database mapping citizens’ awareness. Sulitest has become an active contributor to the 2030 Agenda by providing tangible indicators to map sustainability literacy and to monitor its progress. In September 2015, heads of state from all around the world gathered at the United Nations headquarters to adopt the 2030 Agenda for Sustainable Development, an ambitious “plan of action for people, planet and prosperity,” with 17 Sustainable Development Goals (SDGs) and 169 targets, aimed at nothing less than “transforming our world.” The agreed focus for countries, organizations, and citizens over the next 15 years, is to “mobilize efforts to end all forms of poverty, fight inequalities and tackle climate change, while ensuring that no one is left behind.” The SDGs offer a coherent framework and roadmap to coordinate multiple stakeholders’ initiatives and to accelerate the transition towards a sustainable future. Higher education has an important role to play in this agenda. As stated by Wood et al. (2016), the integration of ESD in Higher Education Institutions (HEIs) results from a long process. Wals and Blewitt (2010) identify three stages capturing the integration of ESD in higher education. During the 1970s–1980s, the focus was more environment-oriented (e.g., green chemistry curricula). In the 1990s, ESD progressively integrated students’ awareness (good practices, green behavior). Since the 2000s, a paradigm shift requiring new pedagogical approaches has been called. A major turning point occurred during the United Nations Conference on Sustainable Development (UNCSD) RIO + 20 and the establishment of the Higher Education Sustainability Initiative (HESI) (https://sustainabledevelopment.un.org/sdinaction/hesi). This initiative gathers more than 300 HEIs in partnership with United Nations Department of Economic and Social Affairs, UNESCO, United Nations Environment, UN Global Compact’s Principles for Responsible Management Education (PRME) initiative, United Nations University (UNU), UN-HABITAT, UNCTAD, and UNITAR. For the first time in the context of UN initiatives, HEIs acknowledged the responsibility they bear in the pursuit of a sustainable future and agreed to act collectively and to share practices. The broad scope of initiatives aimed at integrating sustainability in higher education includes pedagogy and learning, academic research, campus management, organizational practices and community impact. Key questions emerge from this starting point: How can HEIs engage students, faculty and staff members in a meaningful and culturally relevant way? How can HEIs evaluate the awareness of their students and adapt their pedagogical approach? How can HEIs monitor learning outcomes on global systemic topics like the SDGs? The question of learning outcomes, and more broadly the impact of ESD on graduates, is critical. Knowledge and awareness are key outcomes expected from the incorporation of sustainable development in higher education. The literature also identifies skills, mind-sets, and attitudes as a “powerful influence on their sustainability intention, which in turn affects behavior” (Swaim et al. 2014). Students can acquire these skills thanks to competence-based education or collective learning (Cotgrave and Kokkarinen 2011; Missimer and Connell 2012). In practice, this means enabling students to develop critical, holistic, systemic, interdisciplinary thinking (Mather et al. 2011; Sipos et al. 2008). Project-oriented learning is another proven method of supporting integrative approaches to sustainability in higher education (Leal Filho et al. 2016). The combination of these dimensions defines the concept of Sustainability Literacy as “the knowledge, skills, and mindsets that help compel an individual to become deeply committed to building a sustainable future and allow him or her to make informed and effective decisions to this end” (Décamps et al. 2017). Learning about sustainable development requires multidisciplinary approaches and exploring various themes (e.g., soil quality, forest health, social inclusion, etc.) as well as the interconnectedness of these themes to support and develop system thinking (Rieckmann 2012; Svanström et al. 2008; Wiek et al. 2011). As a tangible implementation of HESI developing and mapping sustainability literacy, the Sulitest initiative is one important answer to this pressing need. Sulitest is a movement whose mission is to support expanded sustainability knowledge, skills, and mind-set that motivate individuals to become deeply committed to building a sustainable future and to making informed and effective decisions to this end. Inspired by the UNCSD RIO + 20 (Article 47 of the final document) and created in the context of the UN HESI in September 2013, Sulitest became one of the first featured initiatives of the UN Partnerships for Sustainable Development Goals in 2016. Led by an independent NGO and co-created with a community of users and a network of contributors, Sulitest is supported by 39 international institutions and networks such as UNESCO, UN Environment, UNGC PRME, UNDP, GRLI, IAU, and UN DESA. Working to provide free, accessible, global, and locally relevant tools, Sulitest currently offers an initial set of online tools to raise awareness and to improve understanding of the 17 Sustainable Development Goals (SDGs). More tools are currently being developed. Sulitest’s best-known tool – the Test – is in an easy to use, online, multiple-choice-question format. Each organization mandates “Examiners” who can organize a Test Session with the automated online tool and invites his/her students or colleagues to participate. The “Examiners” can choose between several modules available to design their Test sessions, the main module being the International Core Module (only mandatory module in a Test session). The International Core module consists of a set of 30 international questions that are selected from an expert-approved database by an algorithm. This core module covers global issues and is taken by everyone regardless of their country of origin. An individual’s test results are provided with a comparison to the global average of other test-takers. The questions developed by Sulitest for its International Core module are based on verified and reputed sources that are subject to a broad consensus in the community of researchers and practitioners in the field (international texts and reports, UN conventions, specialized national agencies, etc.). A Senior Advisory Board (SAB) with representatives from international organizations and UN agencies validates the questions, the sources, the learning statements, and the iteration of the tool. Questions must assess an individual’s current knowledge of sustainable development and provide an informative “learning statement” that motivates additional learning and action. The number of questions should not overwhelm the test taker. The overall experience of taking the test should help learners to understand the bigger picture, to be touched and inspired by specific stories or facts. Topics should be balanced between alarming news and inspiring actions. Learners should be able to establish inter-linkages between topics. To reach these ambitious objectives, the test is designed with: (1) a foundational matrix that provides a coherent, educational, and systemic framework; (2) questions tagged with up to three thematic tags to ensure balanced representation of concepts within each Test; (3) an alignment with the SDGs’ framework to provide indicators on the 2030 Agenda. The Sulitest core mission is to ensure that every decision-maker, and all of us, are “sustainability literate,” which includes sustainability knowledge, skills, and mind-set. The Foundational Matrix of Sulitest is designed with all three elements (The full details of the Foundational Matrix and the list of Tags can be found here: http://www.sulitest.aleaur.com/files/source/Sulitest%20V2%20-%20Architecture%20and%20tags.pdf). Finding relevant and universal sources acceptable to everyone worldwide is never an easy task. It is simpler to find consensus on questions based on “knowledge” facts and concepts, as opposed to the more complex approaches needed to investigate skills and mind-set. For this reason, and because the International Core module is used as a common entry point to sustainability literacy worldwide, the current test questions used in this module focus primarily on the knowledge section and are linked to the SDGs. However, other modules aspiring to include the skills and mind-set elements are currently being developed (examples are given in the next section). To sharpen the interpretation of the results, each question is tagged with up to three thematic tags (in addition to one subject from the matrix). Each question is also linked to (up to) three of the SDGs, providing tangible indicators for monitoring the progression of core literacy in all 17 SDGs. These indicators are communicated on a yearly basis to estimate how well citizens are equipped to face the challenges covered by the SDGs and to achieve the 2030 Agenda. They constitute the Sulitest contribution to the Partnership Exchange for the SDGs during the High-level Political Forum (HLPF) at the UNHQ (Carteron and Décamps 2017; Carteron et al. 2018). Sustainability awareness also integrates local or specific issues. That is why the International Core module is usually combined with a specialized module with 20 additional questions. Locational modules cover national, regional, and cultural specificities (environment, laws and practices). The commitment to culturally relevant tools is one of Sulitest’s unique attributes. The Regional/National Expert Committees (RNECs) lead the development of Sulitest in their local environment by coordinating diverse stakeholders to develop local questions, translating content into their own language when needed and engaging local HEIs in using the Test. As of January 2019, 17 countries/regions have already developed their own set of local questions. Eleven other countries are currently adapting their questions to the new format (see the map below). RNECs are crucial for the formal development and the sharing of local modules. In addition, every individual is encouraged to propose content and to contribute to the evolution of the tool. 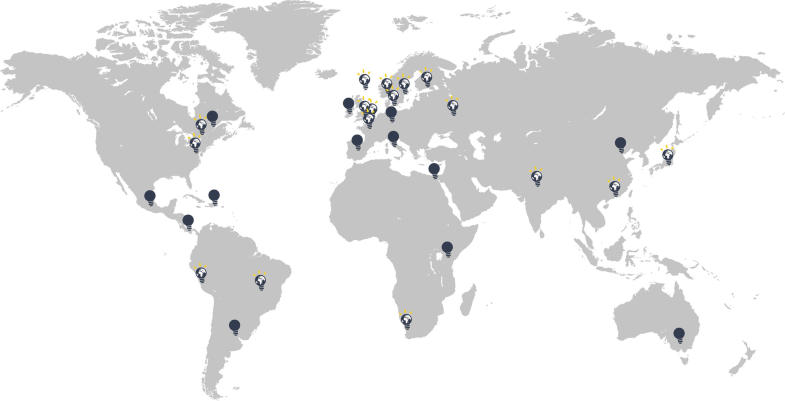 Hundreds of people around the world have at some point contributed their time, energy, ideas, and goodwill to the project and the community; and they continue to do so (Fig. 1). Topical modules focus on a variety of issues. To support understanding of the SDG framework, Sulitest and UN DESA have developed a module on the SDGs’ overall conceptual framework in 2017. In support of the in-depth review of SDG 7 at the 2018 session of the HLPF, the Division for Sustainable Development of the United Nations Department of Economic and Social Affairs (DSD/UN DESA) – the Secretariat of the HLPF – led a process to create a Sulitest SDG 7 module for use by all. A specific module to address SDG 11 challenges focusing on holistic waste management was developed in 2018 by Sulitest and the UN Environment – International Environmental Technology Centre (IETC) in Osaka, Japan. Other topical modules are currently being developed such as SDG 4: Inclusive and Equitable Quality Education, in partnership with UNESCO. Finally, an optional anonymous survey is provided to the respondents at the end of each session to collect data for research purposes, including sociodemographic characteristics, interests, and sensitivity to sustainability issues. If the candidates are students, Sulitest adds some questions about prior education on sustainable development. All these tools are free and available online (www.sulitest.org) as a common good for any HEI, corporation, institution, NGO, or other type of organization willing to raise awareness on sustainability challenges among its students, faculty, staff, or other stakeholder and to collect indicators on progress. Initially deployed in the academic world, more than 115,000 people from 890 universities and organizations in 68 countries have already taken the Test as of January 2019. In addition to the Test, a second tool is provided as a common good on the Sulitest platform: the Quiz. This tool is designed to ease students and staff engagement in a shorter time with a playful mode. The facilitator displays the Quiz on a projector screen and gamers use their computer, tablet, or phone to connect. Played as an interactive game between several teams, the Quiz is based on 10 questions that can be taken from the International Core module or from a Specialized module. Each question appears in real time and team scores are displayed on a graph, along with a learning statement. At the end, a summary displays the overall results and the winning team. The Quiz game can be used during board meetings, classes, and other events for quick, fun engagement and to help raise awareness of sustainability. Accepting donations from corporations, institutions, foundations, and individuals. Several examples of Customized modules used for different audiences are cited below. Paralleling the HLPF in 2017, UNGC PRME (in collaboration with McGill University and Kedge Business School) launched a worldwide questionnaire based on Mintzberg (2015) major contribution on “Rebalancing Society.” The aim of this module is to estimate the students’ current perception and willingness to rebalance society. This questionnaire is conducted iteratively to monitor the evolution of students’ perspective to “rebalance society” and to inform UNGC PRME. Through its working group on Sustainability Mindset, a network of academics in over 35 countries, the UNGC PRME initiative is working with Sulitest to manage a module on Mind-set. Knowledge of the 17 SDGs provides both a path for possible actions and a vision for a “world that works for all,” in the words of previous UN Secretary-General Ban Ki-Moon. There is a need to develop a particular mindset, since the mindset is the lens through which we analyze information and make meaning. This includes systems thinking to understand causes and effects not only in linear ways, but also the cyclical, circular and web-like interactions. Furthermore, a mind-set for sustainability relies on the ability to unleash creative thinking in order to imagine and reinvent how we produce, source, or distribute services and goods. It incorporates the “being” dimension, which includes awareness of the values that anchor our identity and that manifest in our decisions and behaviors, as well as aspects of our higher self, such as purpose and personal missions. Questions in the Mind-set module enable students to explore their emotional reactions to the data, their assumptions, their contributions to the problems, and how their current behaviors are not sustainable, or are creating positive change. Questions involve personal reflection, without a right or wrong answer. Educators can create dialogues in their classrooms to address these key aspects that help develop the mind-set for sustainability. In October 2017, a module for designers was co-produced by Kedge Design School and the Cumulus network. It was presented at the World Design Summit in Montreal during the workshop, “How can we assess and report on sustainability’s impact in our programs and be sure that we are producing sustainability-literate graduates?”. This module will be made available to members of the Cumulus network as soon as next academic year. Onet, one of the first corporate partners of Sulitest, has used this tool since 2017 in its curriculum at the Responsible Manager Center. In the context of Onet University, managers were able to learn more about the major global issues. They were also able to test themselves on the actions carried out under Onet’s responsible development policy, “A present for the future!”. This application of Sulitest opens up new opportunities with the current partners who are already interested, and with new prospects. For 2 years, this school has used customization at two different levels. The first level takes place at the arrival of new students on campus. They take the Core International module as well as a module on the CSR strategy of the school. Sample questions include: “To what extent did Kedge Business School’s CSR and sustainability policy influence your decision to enroll into the school?” and “Do you think that knowledge about CSR and sustainable development will be useful in your professional life?”. Those questions help the school understand better the sustainability awareness and affinity for specific actions by their incoming students. The second level is customization for a specific course. Before the course, students are invited by their teacher to take a specific module relevant to that course, for instance, responsible finance, sustainable supply chain, or others. This snapshot gives an idea of the subjects on which the students are stronger, and on which the teachers have to focus on. Sulitest is organized as a collaborative initiative since the pilot version launched in September 2013. It is engaged in a continuous improvement process building on the feedback and contributions from its community. After a pilot phase (2013–2016) with 44,000 tests taken, Sulitest launched the current tools in September 2016 to offer powerful engagement and educational opportunities. They include a revision of: (1) the foundational matrix on which the test questions were based, (2) the test questions themselves, and (3) the web platform. Additional development and research will further enhance the initiative and should overcome three main accepted limitations of the tools. Firstly, the results of the test’s Core module are comparable in a limited way. While the question bank (and the selection process) is the same for everyone, the condition under which the tests are taken can be different depending on the university’s choice (duration of the session, learning statement, etc.). Secondly, the question bank is still not large enough. Even if all the subjects of the matrix are covered, there is a pressing need to produce more questions. Thirdly, the test is currently a powerful raising awareness tool, but it needs more academic and scientific tests to become a robust assessment tool. Three phases are now supporting the Sulitest movement and will help overcome these limitations. Phase 1 includes the currently available revised tools. The International Core Module is now the anchor with a focus on “knowledge” questions. Optional Specialized modules (Locational or Topical) are also available. Demographic data is collected for research purposes and the Quiz is made available for all. Explorer and Customized modules are also available for a fee. The Community Platform that will further increase the community’s ability to co-create Sulitest questions and modules (similar to a wiki concept with additional expert review features), and that is beta tested in one university in France in September 2018. Tools for teachers such as discussion questions, sample slide decks, case studies, and curriculum examples that will be made available on the Sulitest website for the 2019 school year. Initiatives to take Sulitest to the next level regarding research and robustness are also under way. The first International Collaborative Strategy Session with researchers took place in June 2018, and kicked off a coordinated discussion of the international research community around Sulitest. Two of the pilot studies focus on the rigor of the tools developed by Sulitest and how to sharpen the interpretation of the data collected. These studies will help to scale up the initiative. The objective is to move from an interesting engagement tool to a robust assessment tool in the future phases of the initiative. Phase 3 includes areas to develop in the future. With the increased rigor expected from Phase 2, Sulitest looks at the possibility of creating a Certificate. In addition, a Sulitest tool that includes not only a Knowledge Test but also the Mind-set and Skills components may be developed, which together would make a comprehensive test of Sustainability Literacy. Sulitest is also committed to creating culturally relevant tools for any region in which there are people who would like to engage and become active in the community. Sulitest looks forward to establishing more national committees that can create relevant modules for their areas and to translating tools into more languages. This chapter explores the effort of an international and collaborative initiative to achieve sustainability literacy for all. Sulitest is developing online tools to advance citizens’ sustainability awareness and to monitor progress. By providing tangible indicators on the awareness of the SDGs, it is contributing to the Global Agenda and to the literature on ESD. Firstly we highlight the role of collaboration and co-creation inside the Sulitest community to improve the tools and to accelerate their adoption. The importance of co-creating global tools as well as culturally relevant and country/region-specific tools has emerged from the community. Secondly, the Sulitest initiative aims to enhance sustainability literacy based on a systemic perspective. It means expanding citizens’ awareness on a comprehensive scope of sustainability challenges and on their interlinkages. It also needs to cover the three dimensions of sustainability literacy, which are knowledge, skills, and mind-set. Finally, the diversity of the tools and their potential uses provide multiple ways of engaging citizens in the path toward building a sustainable future. The future phases of the initiative will bring two main developments. A collaborative platform will enhance the ability of the community to collaborate in an efficient way. This platform will increase the question bank and allow any individual to propose new content or to improve the tools. The second development is the formation of a research group conducting pilot studies to sharpen the robustness of the tools and to help build a certificate. The Sulitest community is active, and it is growing rapidly. It will push the momentum further to achieve sustainability literacy for all and to build a sustainable future. Join in! (www.sulitest.org).